Decor Home Ideas - Home Decor Ideas, DIY, Gardening and all the things you need to make your home the perfect place! 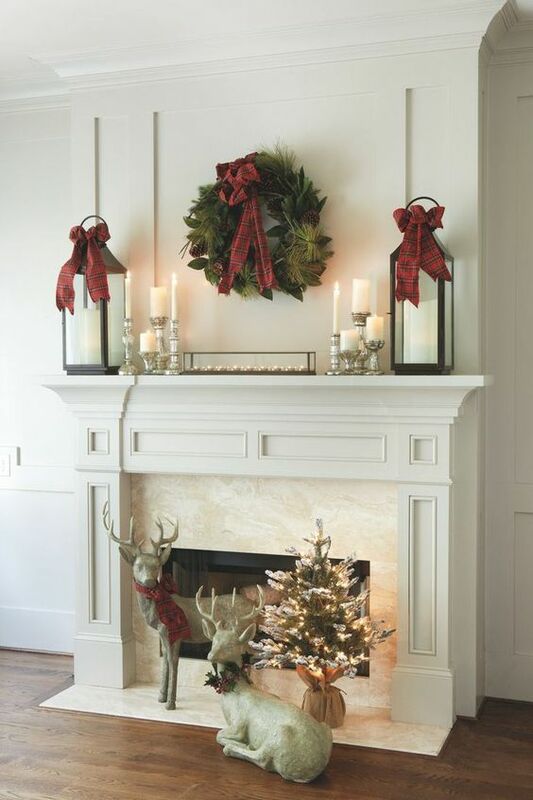 15 Ways To Add Christmas Cheer To Your Mantel! My outlook on Christmas decors changes each year. I have been simple and wise in the details, much like the year I’ve had. I’ve been high with the spirit of celebration and over the top in every way possible, too. 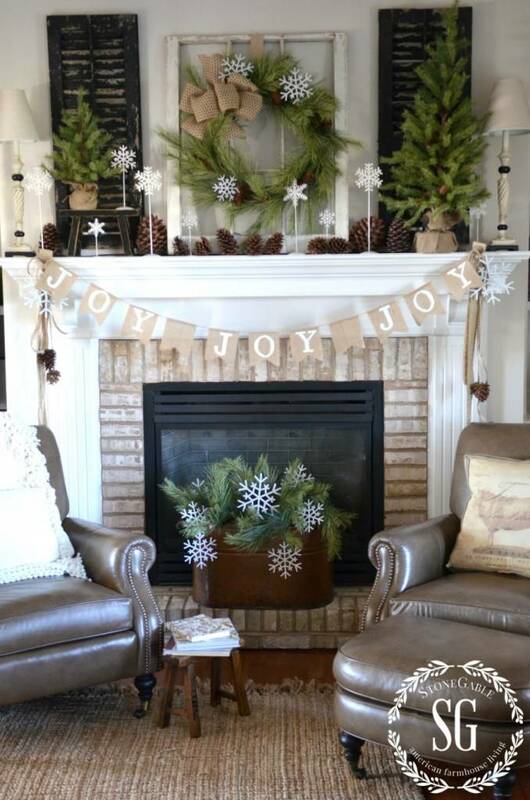 What I find is I never run out of ideas or eagerness to decorate my home this time of year. The spirit of Christmas is miraculous and shiny in many ways. It’s more than an ordinary celebration. I am one of those people who can feel festive, joyous and blessed with a small candlelight at the dinner table. Or with a full blow out of celebratory decorations, tree ornaments passed from generations in my family, and fireworks to top it off. Both ways work perfectly for me. What I crave for is the spirit and passing it onto others. That is why I am the decorator and I have established some form of rights over the years. While we dust off ourselves from elections, somehow I realize I got elected to decorate homes without me ever realizing I was a candidate. I think we deserve a sparkling, beautiful and peaceful Christmas this year. 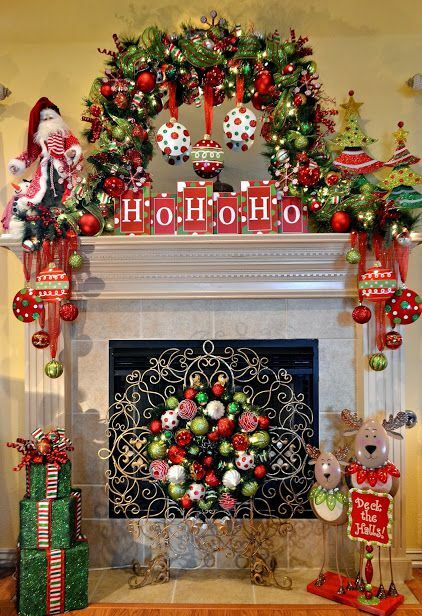 While we sip on eggnog, hot chocolate, (or healthy Christmas smoothies) we take a break to enjoy our decorative work. The music is one of the timeless Frank Sinatra and Dean Martin classics. Cozy light blue pillows, a wide fireplace for the cracking sounds of the woods and a couch for all snugglers in the house. Much like a dream when you add the lights on top and the generous green decorations. I dare you to buy this year a giant star or a couple of them. Another option is to do it yourself, put as much of the sparkling particles of glitter as you want on top. This complication is reminding us that stars are the brightest around the Christmas time of year. 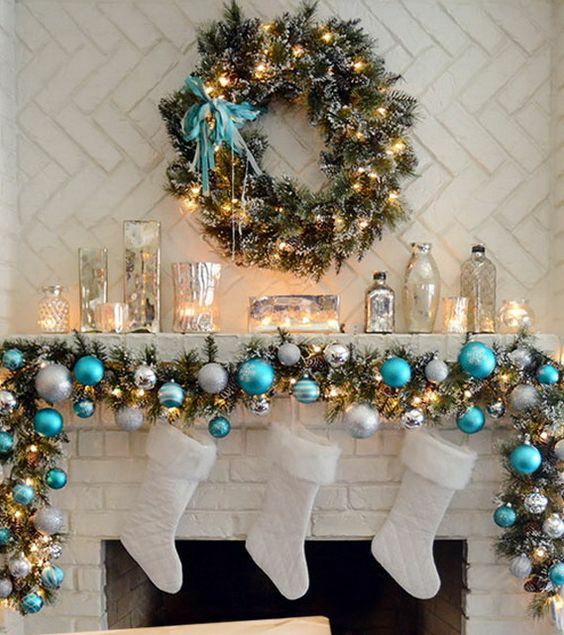 This white mantel loves the play with the blue and silver ornaments, which is also a combination I have done. I encourage you to take empty bottles in your home and fill them with shiny objects of your choice. The white socks are unusual and quite stylish. 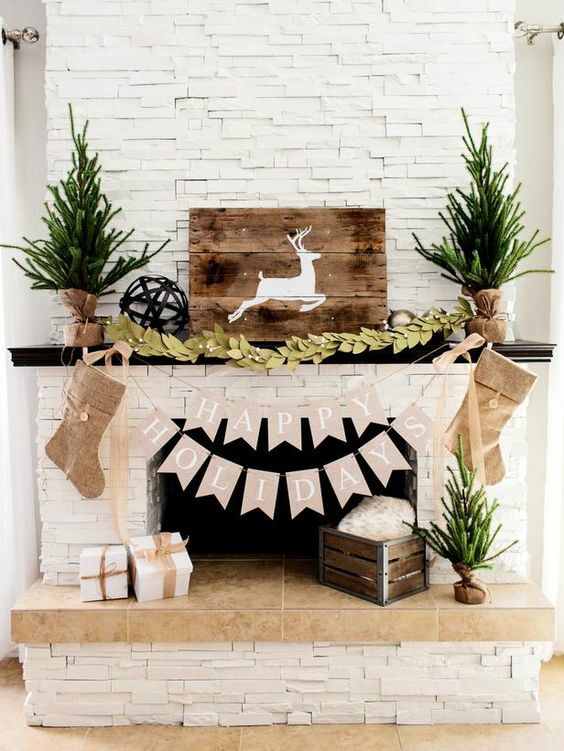 If you have a relatively clean house and no tendencies for hoarding at all, you can place a beautiful framed pattern above the mantel. The result is great. It coordinates in color with the Christmas time and you don’t have to throw it in the box on the first day of the new year. The icy pendants made are so my style. I hang them anywhere it feels right, but I haven’t thought about the fireplace. The design of this one allows it. 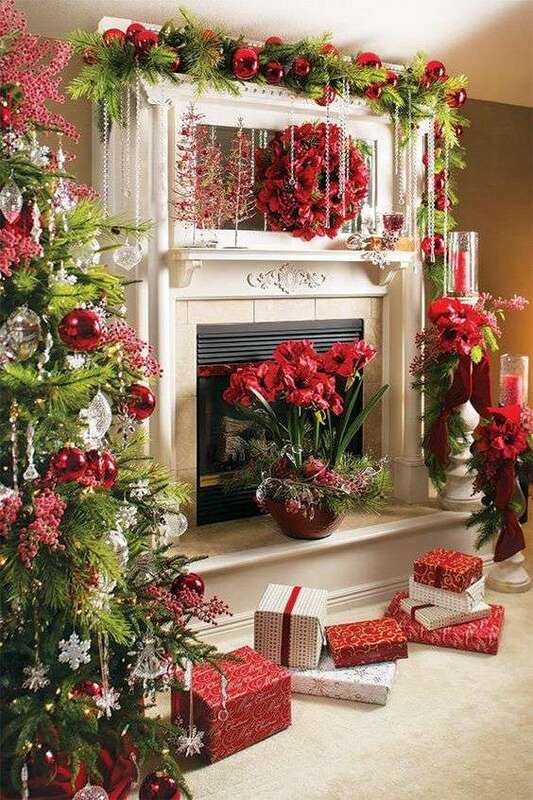 Remember you can always decorate with real red roses, olive branches or pomegranates for that matter. Santa’s raindeers deck the halls, the presents are wrapped and the lavishness of the winter season is here. That is one of the over the top options I have done for numerous years. Christmas time is when you do get away with it. Inside boxes with gifts and huge letter envelopes I have placed pinecones and it was always a great surprise. Snowflake patterns are amazing too and you can draw one, cut out the excessive paper and even paint with glitter and colors. 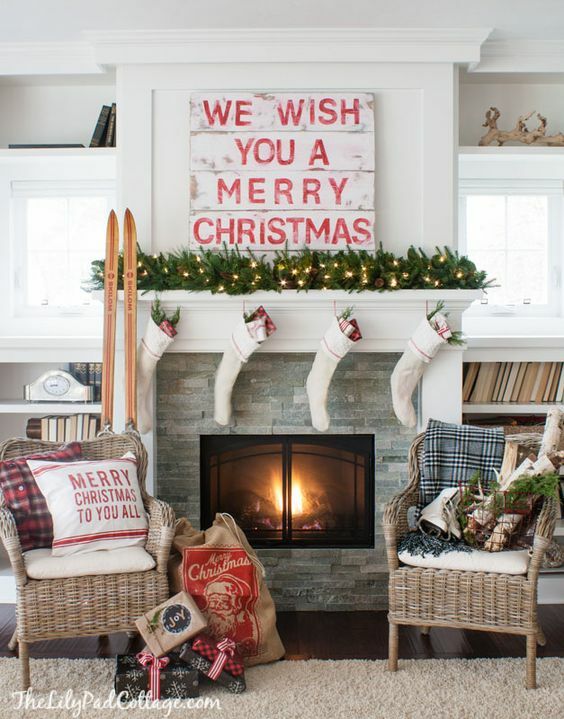 In a joyous, snowy day, we hopped on the Christmas slay of decor. As I mentioned before, I adore the simple designs as well. This one is inexpensive, too. It can be easily put together without spending too much. 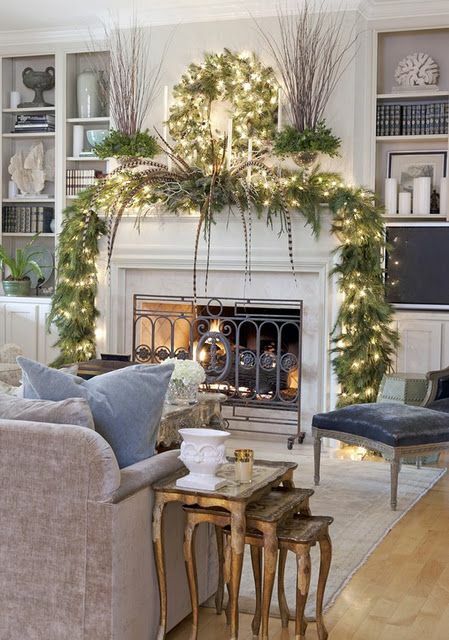 White candles you can find easily and not lose hours wondering about the mantel decor. The Christmas star flower’s name is poinsettia and its bright red is recognizable and loved all over the world. Last year I grabbed the last one at the store, so hurry it up if you’re buying. 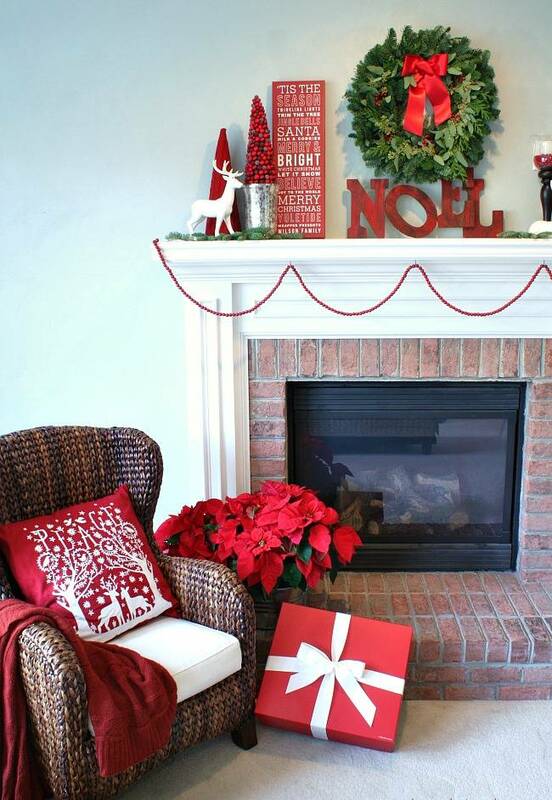 This red Noel theme is eye-catching and awe-inspiring. I’m a special fan of the red pillow and the deer. A dozen little candles, a miniature Christmas tree and the best white wine you can find is what I see here. Tiramisu or a cake with some white frosting and you are all matched with the decor. Your steaming cups of coffee in the morning will compliment the cozy feeling. The classic Christmas decoration calls out for the power of the red. It’s an attention stealer and it is warm like a fireplace. 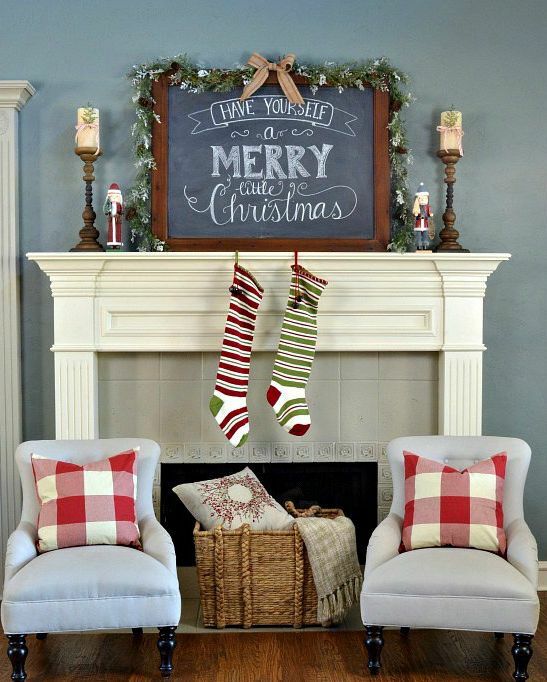 Festivities this year bring strength and win for those who adore being traditional and fill their homes with passion, too. The personal touch added here is more than anything you can buy ready and stacked on shelves at the stores. The board with the saying and the pillow container are elements that are superb on their own. I suspect they are waiting for a bright garland, though. Happy Holidays and three little green trees. 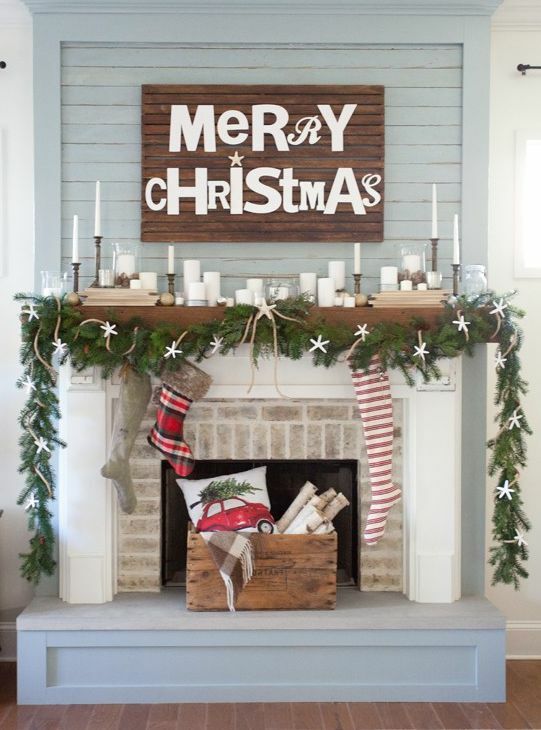 If you are more into farmhouse Christmas decor this one is just for you. Your Chrismas tree can be traditionally of pine, fir or something else, but I always make a couple of other little trees to put on the mantel or the balcony. It just adds to the greenery of the view and there are always extra branches to use. When you are having guests over and you gather for a feast this is the place where you will have your first drink. Put your cozy sweater on and play some music while you unwrap the gifts, sitting on the carpet and sharing a timeless moment together. This is a truly wonderful time of year. 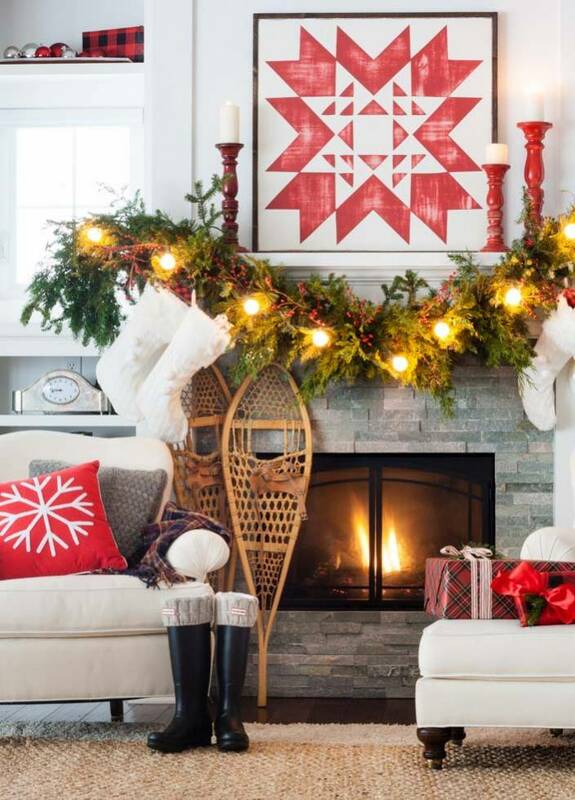 Especially when you allow the snow to enter your home with this last design that resembles snow a lot. 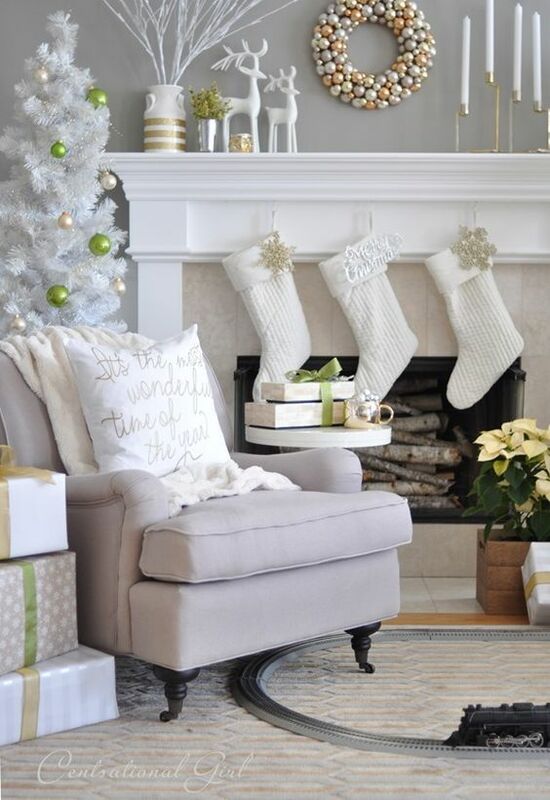 I adore the mix and match of silver, gold, and white because it truly creates a fairytale feel. Now open the champagne bottle, it’s a celebration. Ivo is the owner of Decorhomeideas.com – he started the site back in 2013, when he was still working in a Home Decor company, but the passion for interior design and decorations lead to creating the site and following his own dream of creating a great Home Decor, DIY and Gardening online-magazine. 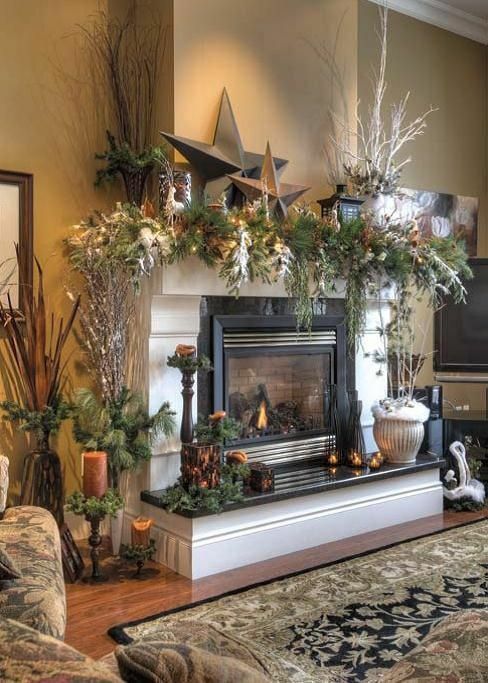 12 Autumn Decor Ideas For Your Mantel To Get Inspired! 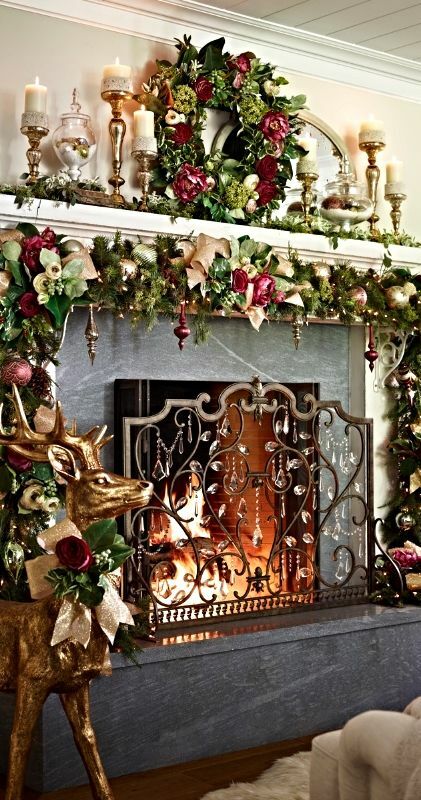 20 Beautiful Christmas Table Setting Ideas To Bring Warmth At Home!